Accelerated CAT® Level 1 Program Offered. What is the Accelerated CAT® Level 1 Program? The Accelerated Certified Accounting Technician (CAT®) Level 1 program is a one-day review course that covers the essential topics you need to pass the CAT® Level 1 examination. This course will be offered during a Saturday weekend that will start at 10 o'clock in the morning and will end at 7 o'clock in the evening. The CAT® Level 1 examination will be scheduled immediately the following Saturday. The Accelerated CAT® Level 1 program is designed for busy candidates who have at least five years experience in accounting or those who are already licensed CPA. The program takes a comprehensive and focused approach on the essentials of bookkeeping so you can gain the knowledge you need to pass the challenge exam of CAT® Level 1 and to help you get ahead. Registration is processed on a first-come, first-serve basis. 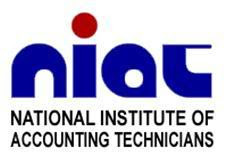 The minimum number of attendees for the program is 25 pax; thus NIAT Philippines reserves the right to reschedule the program if and when minimum number is not satisfied.